﻿Frock Around The Clock will be returning to Belfast's Cathedral Quarter and the stunning location of Belfast Cathedral on Saturday 4th November 2017 for The Wonderful Winter Vintage & Handmade Fair. This event will feature around 70 sellers of beautiful and original vintage and handmade treasures including fashion accessories, jewellery, furniture, homewares, collectables, textiles & decor, artisan food, art, crafts and gifts, & much more besides! Do your vintage and handmade shopping in splendour and also take an audio tour of the Cathedral which is included in the admission cost of £3 (normally costs £5 but this will be reduced to £3 on the day of the event and will include access to the fair and all parts of the Cathedral open to the public). 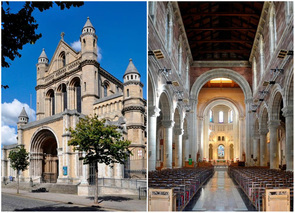 All proceeds from the admission fee will go to Belfast Cathedral open to the public. All proceeds from the admission fee will go to Belfast Cathedral.